Non-traditional lighting in the kitchen offers brightness and elegance over the island. Dark cabinets and brushed nickel accents compliment the large farmhouse sink. Adding glass inserts and cabinet lighting allows reflection from the chandelier while providing a clean and stately look. Second sinks are great for more than one chef in the kitchen. The spindles on the island lend a regal appearance. 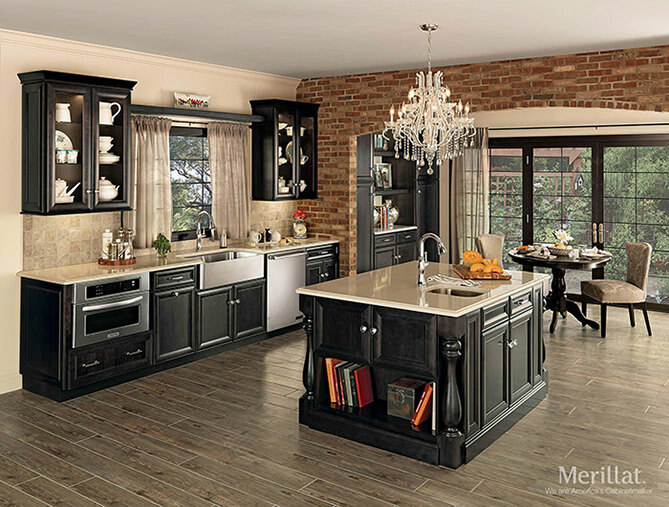 The light tone ceramic tile backsplash compliments the dark cabinetry, and back splash textures of stone and glass are great options. 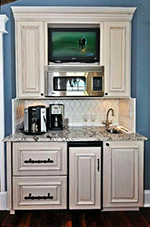 Under the counter microwaves lend more counter space and achieve a clean look. This Entertainment/Snack Bar Hutch is an elegant and functional addition to any room in the home. Sliding barn doors for a vintage or modern look for your home. Painted or Stained, these interior doors are trendy and give your home a personalized classic look. 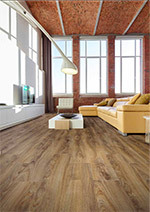 The lovely new options in flooring are stain, heat, water, and scratch resistant. “The kitchen is absolutely the key place for color,” says Lee Eisman, executive director for the Pantone Color Institute, world renowned authority on color. 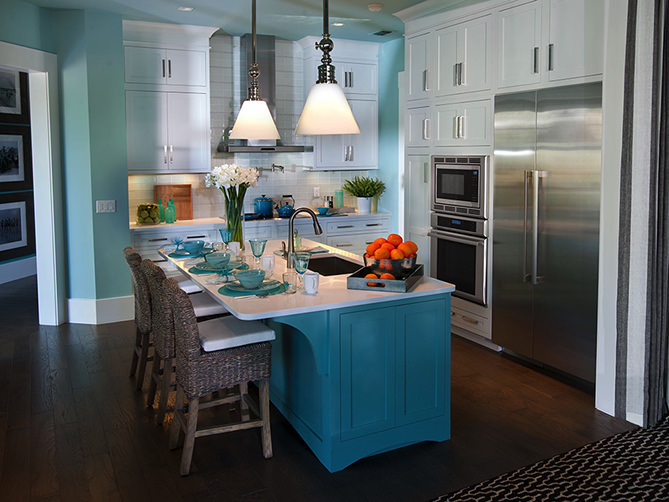 “It’s the place where people gather.” Give your kitchen a French country appeal by adding a painted blue island to blend with the blue hues on the walls masterfully coordinating with white cabinetry and quaint blue accents.